Actress Cate Blanchett, who played Galadriel in The Lord Of The Rings trilogy, will be returning to Middle Earth in The Hobbit. Production on Peter Jackson's The Hobbit is picking up speed, and the director is now in the process of populating The Shire. There were a half-dozen casting announcements made today, but the most prominent is that Cate Blanchett will return to the franchise as Galadriel. 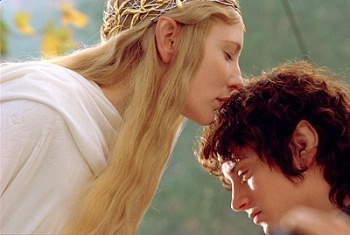 Blanchett previously portrayed the Lady of Lothlorien in Jackson's The Lord of the Rings trilogy. Deadline quotes Jackson as saying, "Cate is one of my favorite actors to work with, and I couldn't be more thrilled to have her reprise the role she so beautifully brought to life in the earlier films." Also returning to Jackson's vision of Middle Earth is Jed Brophy (District 9), who'll be playing the dwarf Nori. Other dwarfs recently cast include William Kircher (Out of the Blue) as Bifur and Ken Stott (Charlie Wilson's War) as Lord Balin. Rounding out today's casting is Sylvester McCoy (Doctor Who) as Radgast the Brown, Mikael Persbrandt (Day and Night) as Beorn, and Ryan Gage (Hamlet) as Drogo Baggins. Bilbo Baggins will be played by Martin Freeman (Hot Fuzz, The Hitchhiker's Guide to the Galaxy), and Blanchett probably won't be the only LOTR alumnus joining him. According to Deadline, "Ian McKellan is expected to reprise Gandalf and Andy Serkis is expected to bring back Gollum."